Eyebrows are one of those things that need to be done if you are wearing any makeup at all. I think the eyebrows really define the face and frame your eyes. This can be a good thing if the brows are groomed and filled in, or it can be a bad thing if you have less pronounced eyebrows and you don't fill them in. This can sometimes make the makeup look incomplete. This is one of those things that all depends on you as an individual. There isn't a one size fits all for brows. You have to take into consideration your face shape, hair color, and natural shape of the brows. It is all subjective. I'll be getting in to all the different products and application techniques for filling in your brows. Starting off with the products that are out there. There is the classic brow powder/eyeshadow. There are brow powders specifically made for your eyebrows or you can just use any eyeshadow powder. 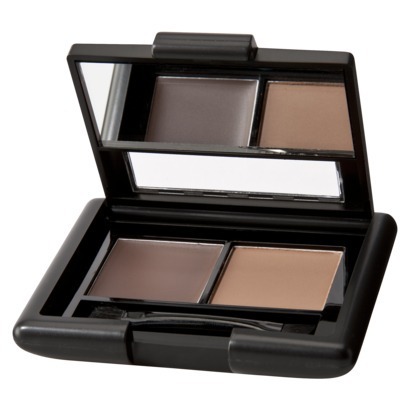 Sometimes these brow kits also include a wax that is supposed to work in conjunction with the powder. You would apply the wax first and then you apply the powder using a small eyeliner/eyebrow brush and it has something to stick to, this also is supposed to make it long wearing. There are a ton of brands that make these little eyebrow kits from high end to drugstore and everything in between. Next up is the eyebrow pencil. This has been around forever, it is the easiest way to get the brows filled in. You have the classic pencil that you have to sharpen, and there are also the retractable pencils. These are great when traveling or to have with you in a makeup bag. A lot of these pencils also have a spooly on the opposite end which makes it a breeze to fill in the brows and then comb them out and blend the pencil in. One of my favorite eyebrow pencil is the Brow Wiz from Anastasia. They also recently launched a different kind of pencil called the Brow Definer. The Anastasia products are really amazing because it actually sets, and it is waterproof. Once your brows are on they are not going anywhere. Another interesting brow product is the eyebrow marker. I have never tried this product personally. It works the same way a liquid eyeliner works. It is a liquid product with a felt tip applicator. The best way to use these eyebrow marker is to do small strokes. I don't recommend trying to do one fluid line from beginning to end since the hair will get in the way. Doing small strokes will also make the application look very natural and give the illusion that there is more hair. These markers are great if you need to get ready quickly since they are very simple to use. One product that is all over YouTube is the brow pomade or gels. 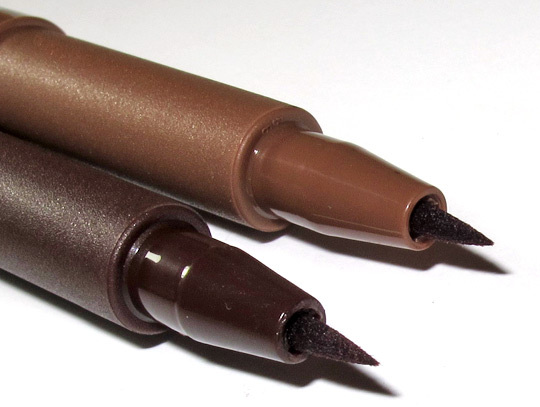 These typically come in a little pot form and they are exactly like gel eyeliners. I have the Anastasia brow pomade and it really is amazing. All you need is a tiny amount, and you can fill the whole brow in with that. I like using a super tiny angled liner brush and it makes it super simple to get the brows done. There is also a version of this that is a bit different and it is the brow gel that comes in a tube. Again with this you will need a small angled liner brush to apply this. It works exactly the same way as with the pomade. The thing with these sort of products is that they are much harsher, if you use too much the brows can look really dark and painted on. The point of filling in the brows is to make them fuller and have more shape, not having painted on brows. Try to use a very light hand when it comes to the pomade products. The last brow product that is out there is the eyebrow gel to set the brows. These come in all colors and some of these products even have fiber to give the illusion of more hair. The clear brow gel is the easiest to use since it doesn't have color you don't have to be too careful when it comes to applying it. There is also brow gels that come in a range of colors from the lightest blonde to the darkest brown. These are perfect for people that already have full brows and you might want to darken them up a bit, or tame them down. I love using tinted brow gel for days when I don't wear makeup or have very little makeup on. It gives the brows a really nice polished look that is very flattering. I also use the tinted brow gel to give dimension to the brows when I do fill them in. Sometimes the brows can look a little one dimensional and flat. Using a lighter brow gel over darker eyebrows can really make them stand out. When applying any product to the brows, I always start off by brushing them through with a spooly. This makes sure that the hair is all going in the same direction and it is the shape you want. 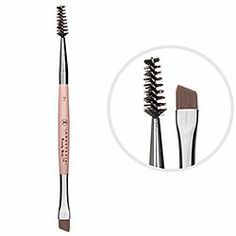 I always like to use a small angled liner brush, the one I love and have been using for years is the Anastasia eyebrow brush #7. This has the brush on one side and a spooly on the other. I recently made a video showing step by step how I like to fill in my brows. I have been using eyeshadow as brow powder for a long time. It really defines the brows, but keeps it soft with the eyeshadow. I have an older video where I show how I fill my brows in using a pencil. You can check out either one below. How I fill in my brows with eyeshadow. How I fill in my brows with a pencil.